Today, scientists from the Bishop Museum, NOAA, and the Association for Marine Exploration published the description of a new species of coral-reef fish that they named in honor of President Barack Obama. The fish, which now bears the formal scientific name Tosanoides obama, was discovered during a June 2016 NOAA expedition to Papahānaumokuākea Marine National Monument in the remote Northwestern Hawaiian Islands. The study is published in the open-access scientific journal ZooKeys. 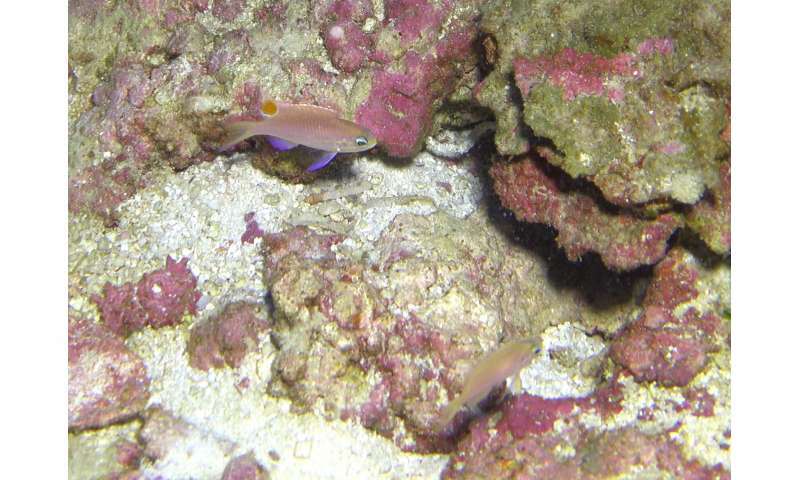 "We decided to name this fish after President Obama to recognize his efforts to protect and preserve the natural environment, including the expansion of Papahānaumokuākea," said Richard Pyle, Bishop Museum scientist and lead author of the study. "This expansion adds a layer of protection to one of the last great wilderness areas on Earth." The Museum is currently showcasing the exhibit Journeys: Heritage of the Northwestern Hawaiian Islands, featuring the Northwestern Hawaiian Islands and the Monument. On August 26 of this year, at the urging of Sen. Brian Schatz (D-Hawaii), conservationists, and many marine scientists, President Obama expanded Papahānaumokuākea Marine National Monument. At 582,578 square miles, it is the largest permanent marine protected area on Earth. 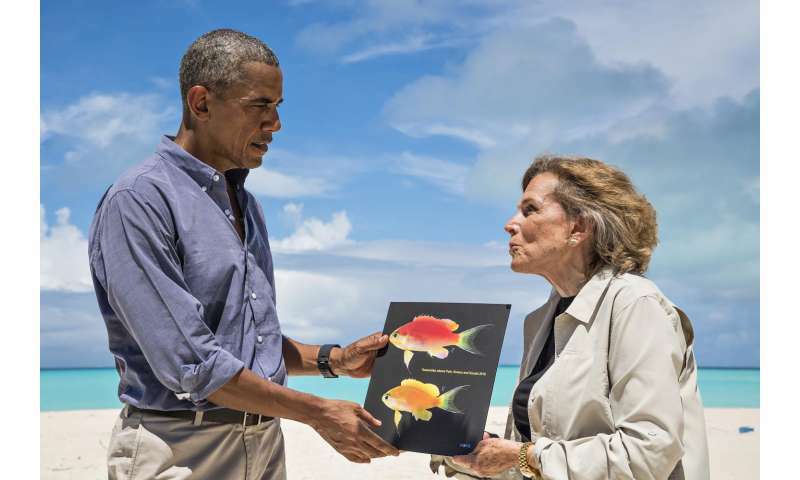 On September 1, during his trip to Midway Atoll within the Monument, legendary scientist, conservationist and deep ocean explorer Dr. Sylvia Earle gave the President a photograph of the fish that now bears his name. The exchange will be featured in the National Geographic global broadcast special, "Sea Of Hope" scheduled to be released on January 15, 2017. The small pink and yellow fish is a kind of basslet, a group that includes many colorful reef fishes popular in the marine aquarium fish trade. There are two other species in the genus Tosanoides, both from the tropical northwestern Pacific Ocean. Males of the new species have a distinctive spot on the dorsal fin near the tail, which is blue around the edge and red with yellow stripes in the center. "The spot on the males is reminiscent of President Obama's campaign logo," said Pyle. "It seemed especially appropriate for a fish named in honor of the president." "The new fish is special because it is the only known species of coral-reef fish endemic to the Monument (meaning that the species is found nowhere else on Earth). Our research has documented the highest rate of fish endemism in the world—100%—living on the deep reefs where we found this new species," said NOAA scientist Randall Kosaki, chief scientist of the research cruise, and co-author on the paper. However, unlike all the other Hawaiian endemic species, which also occur in the main Hawaiian Islands, this new species is special because it is the only one that is limited to within the Monument itself. "Endemic species are unique contributions to global biodiversity," Kosaki added. "With the onslaught of climate change, we are at risk of losing some of these undiscovered species before we even know they exist." The new fish was first discovered and collected on a dive to 300 feet at Kure Atoll, 1200 miles northwest of Honolulu. Kure is the northernmost of the Hawaiian Islands, and is the highest latitude coral atoll in the world. Deep coral reefs at depths of 150 to 500 feet, in the so-called "Twilight Zone" (also known as mesophotic coral ecosystems), are among the most poorly explored of all marine ecosystems. Located deeper than divers using conventional scuba gear can safely venture, these reefs represent a new frontier for coral-reef research. Pyle and co-authors Brian Greene and Randall Kosaki pioneered the use of advanced mixed-gas diving systems known as closed-circuit rebreathers for Twilight Zone research, and have been documenting the previously unexplored deep reefs throughout Hawai'i and the broader Pacific for the past three decades. "These deep coral reefs are home to an incredible diversity of fishes, corals, and other marine invertebrates," said Brian Greene, an experienced deep diver and researcher with the Association for Marine Exploration, and co-author of the paper. "There are many new species still waiting to be discovered down there." 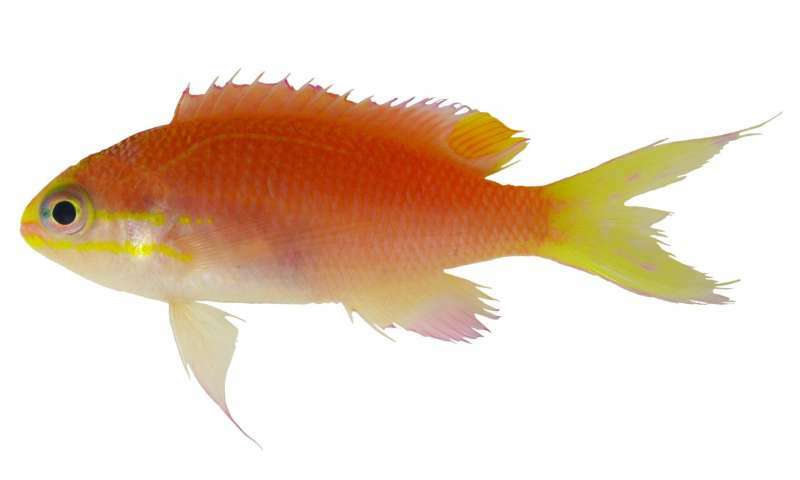 This is the second new species of fish from Papahānaumokuākea named this year. In August, Pyle and Kosaki published the description of a new species of butterflyfish (Prognathodes basabei) based on specimens collected on deep reefs at Pearl and Hermes Atoll earlier this year. President Obama also has several species from other locales named after him: a trapdoor spider, a speckled freshwater darter (fish), a parasitic hairworm, and an extinct lizard.